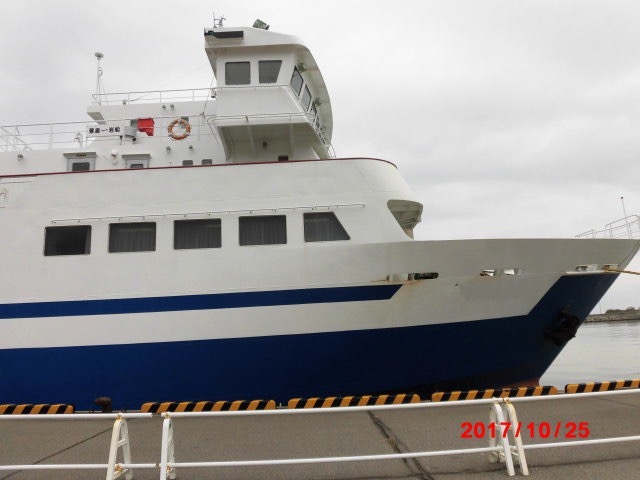 LOA: 66.00m, Breadth: 12.30m, Draft: 3.20m, Depth: 6.97m, Passengers: 487, Service Speed: 12.7, Main Engine: Niigata 6MG26HX 1800ps x2 total 3600ps, Auxiliary Engine: Niigata 540ps at 1200rpm, Auxiliary Engine 2: Niigata, Speed-Consumption: 509L/hr, Propeller: 4 blades x2, Notes: Can carry 4 large trucks and 20 Sedan cars. or 32 cars Bow Thruster. Sewage system and oily water separator winches 5.5 tons x2, FRP Life boats Life rafts life Jackets etc. Delivery Feb-March 2019 Speed Consumption 12.7 knots 509L/H including Main Engines and Aux Engines.